The internet didn’t create the fight for human attention, concentration, and devotion. It just pumped up the problem to an exponentially higher level and makers of music are all too familiar with exactly how intense this ongoing battle is today. Despite this unfortunate familiarity that musicians carry with them, there often isn’t much in the way of a solid and-or lasting proposal of how to tackle the conundrum. New apps, new platforms, new incentives, and more, are all intended to appeal to, and appease, social attention but, in their own way, each new spin on idea presentation only adds to the sea of stuff people are left to sort through and react to. Teaming up with Thomas Bartlett, the producer of weekly, live radio show, A Prairie Home Companion, Thile – the show’s recently dubbed new host – and Bartlett, assembled a track listing of 10 songs out of an available 19, all born from a “Song of the Week” segment included as part every “Prairie” broadcast. The segment sees a new song, written by Thile, brought to life and debuted during the show, often featuring a plethora of stylistically varying artists alongside. Accordingly, one will find fellow musicians and “Prairie” performing alumni, Gaby Moreno, Aoife (EE-fah) O’Donovan, and Sarah Jarosz, contributing some lovely vocals throughout Thanks for Listening. Though the songs are derived from the radio show and feature some of its memorable guests, the music is hardly carbon copied onto a new disc and left at that. Bartlett and Thile’s finesse with arranging has transformed these pieces from melodically sweet, narrative-fueled bits of recitative, to deeply intricate and complex works, which showcase Thile’s propensity for honoring musicians and styles far outside his mandolin’s traditional repertoire, as well as that of “Prairie’s” foundational folk and roots minded fare. In this way, regardless of whether one has tuned in and heard every original debut of these cuts and is now hearing the transformative versions or, this release stands on its own, the music is full of small but important moving parts, unexpected chord progressions, and odd tone and instrument choices that beg more attention be paid over less. The very reverb and sustain-heavy quality of “Feedback Loop” serves to uphold the uncommon motif highlighting an augmented 4th interval and evoking a distinctly Radiohead-vibe. Appearing at only track two, this is a prime example of Thile bucking any expectation of convention based on instrumentation. Furthermore, for anyone who has managed to see him perform solo acoustic shows between tapings, Thile has made his appreciation for the long standing experimental rock group more than clear via tear-inducing covers of recent Radiohead tracks like “True Love Waits,” which he also performed on “Prairie” (though not solo) back in November of last year. Those songs which don’t go to quite as sonically radical territory (at least as far as music for mandolin is concerned,) still work together to continually stimulate mental intrigue and curiosity among anybody within ear shot. “Douglas Fir,” feels notably approachable thanks to the pairing of Thile’s strums and the ushering in of O’Donovan’s melodic presence on a vocal mic (to which Thile is well acquainted from many previous collaborations the two have done). Nonetheless, in cases like these the tool of narrative storytelling that propels “Prairie’s” works, takes the lead and brings people along for the ride, interested to know, or simply imagine more, details about the scenes unfolding between each note. Still others like “Stanley Ann,” give pause for their unique mixing choices. Piano playing a key role (no pun intended) on this track, is blessed with a quality of character that resembles old fashioned, mono recordings (also heard twinkling across the top of the jazzy “Elephant in the Room.”) There’s a layer of echo but the tone feels distant and mildly muted in comparison with Thile’s crisp and clear voice reaching for moments of falsetto in front. And speaking of “Falsetto,” this late arriving song sees Thile and Bartlett (who also is credited with co-recording and playing all keyed – among other miscellaneous – instruments) reviving a sense of the ethereal with a wah-like synthesizer line delivered with a legato directive, backing a rather melodically bouncy and upbeat melody. Here, the track promotes a deep contrast of texture and overall, a sense of looser expanse than the performance on “Prairie.” Its general impression feels more dramatic than the rather cheeky, humor driven delivery created by Thile in solo performance, thanks to nuanced dynamic changes more observable in a smaller space and, deliberate pauses left to open silence – much like a quality tattoo can be made better when less ink in used and open skin is left in place. Though comparison isn’t mandatory to find fascination with the album, the larger context of a track’s life across multiple iterations only further emphasizes how different framing can affect reception and reaction altogether. Not leaving any one of these tracks as an existent version of itself shows another sign of Thile wanting to commend and treat those who give their time to listen to what he and those he knows, have to artistically and creativitely offer. Even the standard “lead single” designation bestowed to “Thank You, New York,” featuring Gaby Moreno, doesn’t bow down to musical convention. Though its more pop rock vibe, which swells from the pre-chorus to the chorus, seems like a move of restraint against the rest of the record, the rest of the song surrounds that reprieve with a flow that inspires eerie vulnerability (Thile’s high pitched and rapid but melodically static mandolin motif against Alan Moore’s downward traveling bass line creates a kind of unsettling scenery music that only calms once chords have moved the song to a major resolution). The song ultimately progresses from there to a feeling of peace and comfort, with beautifully resolving major chords formed across instrumental and vocal notes – all of which descend in dynamic level to an almost whisper upon the last utterance of “New York;” territory beloved by Thile as part of his real life story. Upon first thought, the lead single also feels like an ideal choice for a finale track but the very smoothly sung and melodically gentle title track is just that much more suitable as a conclusion to the time spent listening. If nothing else, perhaps the two could have been placed back to back at the end, creating a sort of clever wordplay with the titles, as well as dovetailing a louder more showstopping form of gratitude with that of a simple and much more humbly sung bow of appreciation to an unknown number of people who get to the end. 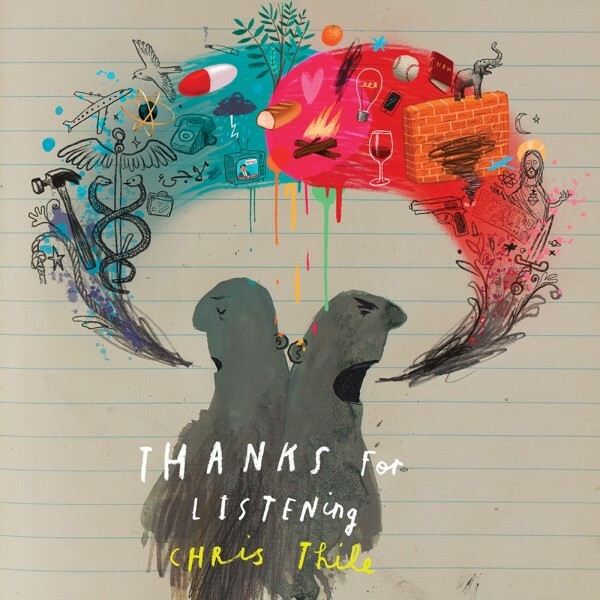 Truly, Thanks for Listening is a deep well of surprises: a grab bag of melodic, rhythmic, and lyrical knick knacks that not only prompts listening but hopes to reward. This concept, if enjoyed by a newcomer, is liable to make diving into A Prairie Home Companion rather easy. However, even without doing so, anyone who wants to experience (another) defiance of musical expectations by Thile and friends, will take to Thanks for Listening like humidity to a fiddle tuning peg. Thanks for Listening is out now via Nonesuch Records. Find it in their store, through iTunes, Amazon, and streaming on Spotify.